IBM® collaborative applications provide traditional templates for business processes, as well as a platform to build custom applications for personal computers, web and mobile devices. With a time-tested messaging system and security model as its foundation, this software is the ideal platform for workflow applications. Support for open standards and open source technology helps you rapidly develop and deploy business applications. IBM® Domino Designer is a highly productive development environment for applications that run on IBM Notes® and Domino. This software enables the rapid development and deployment of collaborative and workflow business applications. Developers can integrate assets from multiple IT systems and provide application access through different clients and devices. IBM Domino Designer is available at no charge. The IBM® Notes® and Domino® products provide client and server software for messaging and collaboration for a wide variety of operating environments. These products allow you to advance your organization as a social business and can help you develop and deploy collaborative and workflow applications quickly and easily. They enable businesses of all sizes to accelerate operations, improve decision-making, increase productivity and realize enhanced business results. 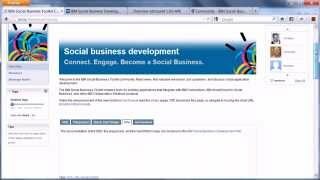 The IBM® Connections family provides a security-rich social network platform and eco-system that can infuse social into all your business processes and throughout your entire employee, partner, and customer experience. The Connections platform and its family of products allows your organization to engage the right people, accelerate innovation and deliver results. IBM Connections can be delivered to virtually any mobile device and can be deployed on-premises and from the cloud.